Two articles published last month in the American Journal of Physical Anthropology are starting to greatly complicate bioarchaeologists' use and interpretation of stable oxygen isotope ratios in an attempt to understand migration and mobility in the past. Science is constantly progressing, and it can be challenging to keep up with the latest research. The real challenge for me, though, is in interpreting the isotope analyses I have done on populations from Imperial Rome - first because only one other oxygen isotope study has been done in the entire Italian peninsula, and second because the ancient Romans were quite unlike other archaeological populations in their mobility and importation of food and water. This post, then, works through some of the ideas I laid out in my dissertation and adds to them in light of recent articles on oxygen isotope analysis. Studying the relative amounts of stable oxygen isotopes in ancient organic material seems to have begun with palaeoclimate studies, as oxygen isotopes are related to various climatological factors that affect the elemental composition of water. The relative amounts of oxygen isotopes of both meteoric (rain, snow) and environmental water (rivers, springs, lakes) vary by region in relation to factors such as temperature, humidity, distance from the coast, latitude, rainfall, and elevation. This means that different water sources in different areas have different ratios of stable oxygen isotopes. The mammalian body needs oxygen to survive - not just in the form of air (inspired oxygen) but also in the form of water and food. Researchers became interested in looking at the amount of oxygen trapped in mammalian tissue decades ago and began measuring the abundance of two different isotopes of oxygen: 18O and 16O. The ratio between these two measurements - written as δ18O ‰ (per mil) - results from fractionation of the two isotopes, which is caused by different metabolic processes. Starting in the 1990s, though, bioarchaeologists began studying stable oxygen isotopes in order to investigate ancient migration. 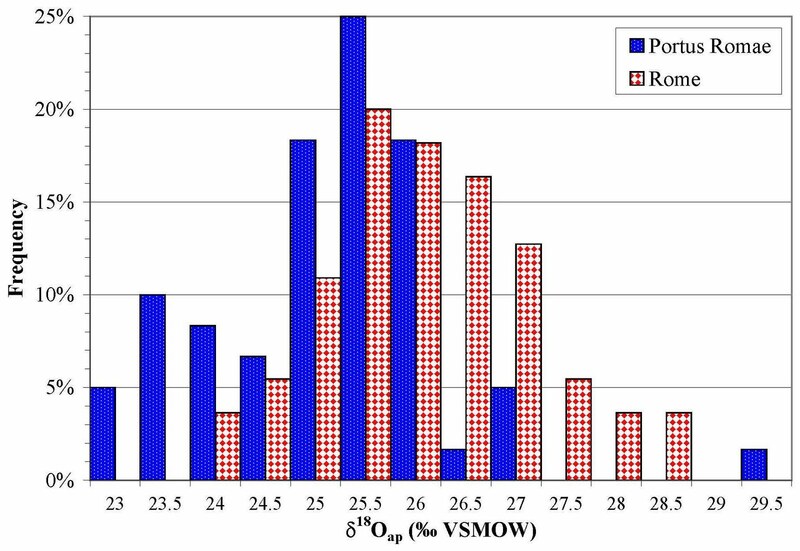 If the majority of the oxygen that a person ingested or inspired while his teeth were forming came from local water sources, the measured δ18O value from his hard tissue would be characteristic of the geographical peculiarities of that water, taking into account metabolic fractionation processes. It should be possible, then, to use δ18O numbers to identify individuals who accessed either local or nonlocal water sources and, by inference, locals and immigrants. In the early 2000s, oxygen isotope analysis became widely used in answering questions about past human mobility, including identifying immigrants and pinpointing their geographical homelands. Within the past decade, though, researchers have learned much more about oxygen isotope ratios, including the metabolic processes that affect fractionation. In fact, two articles published online on May 3 by the American Journal of Physical Anthropology demonstrate just how complicated it can be to interpret oxygen isotope ratios from past human populations - a topic that I've been thinking about a lot lately as I write up for publication my own oxygen data from Imperial Rome. Pollard, Pellegrini, and Lee-Thorpe (2011) are the first to put into print the issues with assigning a geographical homeland to immigrants identified through oxygen isotope analysis in their paper, "Some observations on the conversion of dental enamel δ18Op values to δ18Ow to determine human mobility." In essence, those of us working with oxygen isotopes have been attempting to relate our human dental enamel oxygen measurements to measurements of oxygen from groundwater, using one or more linear regression equations. These equations helpfully give us numbers that seem to put our interpretations of homeland on solid footing. Pollard and colleagues, however, do the math and show that the magnitude of the error introduced with the regression equation(s) means our approximations of immigrants' homelands based on the oxygen isotope ratio of local groundwater are really quite poor. They suggest instead that oxygen ratios derived from human enamel should be compared directly to other human enamel samples. Reitsema and Crews (2011) throw another wrench into oxygen isotope analysis with their paper, "Oxygen isotopes as a biomarker for sickle-cell disease?" Oxygen isotope fractionation results from various metabolic processes, as I mentioned above. In humans, differing oxygen isotope ratios can result from smoking, exercise, and disease. For example, there is increased fractionation in smokers, due to their compromised ability to diffuse oxygen through the pulmonary membranes. Conversely, people who engage in routine exercise appear to have a decrease in fractionation because of the increased rate of respiration. It has also been established that oxygen isotope fractionation is lower in people suffering from anemia, as the binding of oxygen to hemoglobin is a fractioning process. Because of these known fractionation effects, Reitsema and Crews hypothesized that the bone tissue of an organism with sickle-cell disease would have a different oxygen isotope ratio than a healthy organism. They studied bone apatite from 24 mice - 8 control and 16 transgenic mice with human HbS (mutant hemoglobin S) genes that cause sickle-cell disease. The bones of the sick mice had a significantly (p=.002) lower oxygen isotope ratio than those of the healthy, control mice. In fact, the sickest mice had the lowest oxygen isotope ratios. This study has far-reaching implications for bioarchaeological analysis because it is currently quite difficult to identify individuals with sickle-cell disease (and other kinds of anemia) within an archaeological population. We tend to use frequencies of observable pathologies - like cribra orbitalia and porotic hyperostosis - to infer anemia in an individual, but these are non-specific disease processes and cannot be directly tied to sickle-cell disease or another condition. In my bioanth lectures on population differences and human variation, I always discuss the sickle-cell trait as an example of the heterozygote advantage. But let's back up a second. Many genes have two or more forms, called alleles. If a person has two copies of the same allele for the same gene, that person is said to be homozygous, and if a person has two different alleles, that person is heterozygous. I'm simplifying this a bit, but let's say that HbA is the allele for normal hemoglobin, which is present in red blood cells and carries oxygen through the body. 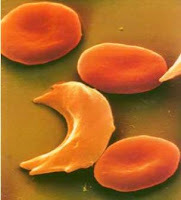 The allele HbS, on the other hand, produces a different kind of hemoglobin, making the red blood cells sickle-shaped. 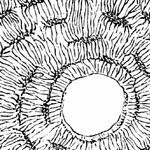 This anomalous shape interferes with the body's ability to store and circulate oxygen. Those people who have two copies of the HbS allele develop sickle-cell disease, which results in a much shorter life expectancy than normal. The heterozygote advantage here is that people with one copy of the HbS allele have enough normal hemoglobin to survive into adulthood yet enough sickled red blood cells to fight off malaria (as the malaria parasites don't survive in the sickled red blood cells). One of the major questions facing bioarchaeologists who work in ancient Italy is, understandably: What was the prevalence of malaria in the population? This question has been tackled primarily by Robert Sallares using historical data in his book Malaria and Rome: a History of Malaria in Ancient Italy (2002) and by David Soren using osteological data in papers like, "Can archaeologists excavate evidence of malaria?" (2003). I don't think anyone doubts that malaria was endemic in ancient Italy considering its prevalence in 20th century Italy. The problem is that, as Reitsema and Crews note, it's not clearly visible in the skeletons comprising an archaeological population. A 2008 study by Bianucci and colleagues showed evidence of P. falciparum (one of the parasite species that causes malaria) in a mummy's soft tissue; but this was one mummy, and the vast majority of our ancient bodies are not that well preserved. Another problem is that we don't know the frequency of people with a heterozygote advantage - those individuals who are heterozygous for sickle-cell disease or for thalassemia, both of which confer protection against malaria. These individuals may exhibit anemic reactions but not as often or as severely as people with sickle-cell disease or thalassemia. This histogram shows the distribution of oxygen isotope ratios in two Imperial-period populations: one from the cemetery of Isola Sacra between Ostia and Portus Romae (Prowse et al. 2007) and one from two cemeteries (Casal Bertone and Castellaccio Europarco) located just outside the city walls of Rome (Killgrove 2010). There are outliers in both populations - and a quite dramatic one from Portus - but the distributions themselves are different. The population from Portus Romae has lower oxygen isotope ratios on average than the population from Rome itself. 1. Water Sources. The city of Rome had a vast network of aqueducts, whereas Portus had only one. The aqueducts from Rome, though, were fed by springs at the base of the Apennine mountain range. With increasing elevation, we actually get a concomitant decrease in oxygen isotope ratios. So I don't think that water sources alone can explain the difference, since we would expect oxygen isotopes from Rome to be lower than from Portus. 2. Diet. Part of the a oxygen in person's skeletal tissue comes from the water in food. If people from Portus and people from Rome were eating dramatically different food - types, quantities, imports - or preparing it differently, then we may expect the isotope ratios to differ. There are differences in diet between Portus and Rome, as I've blogged about before in my post on the Bioarchaeology of Roman Seafood Consumption. So this could indeed factor into the above histogram. 3. Homeland. Portus and Rome were both immigrant-receiving areas. This is not a stretch of the imagination, since slavery was widespread in the Empire and both cities would also have attracted merchants, students, and travellers. But suppose each city attracted immigrants or slaves from specific homelands. Prowse and colleagues interpreted their oxygen isotope data to suggest that people may have been coming to Portus from areas with higher altitude. I interpreted my oxygen data to suggest that, while many people seem to have been local, there were plenty of people with lower and higher oxygen isotope ratios, who came to Rome from areas with higher elevation/colder climates and lower elevation/warmer climates. This interpretation has been my favorite so far - I don't know of any historical evidence that shows that different cities in the Empire pulled slaves or other immigrants from certain areas, and I think this histogram lets me at least suggest that it's a plausible scenario. 4. Malaria. The Reitsema and Crews article - although it's about bone apatite in mice rather than human enamel - brings up another possibility, though: that the people at Portus were more affected by sickle-cell disease than the people from Rome. Both areas were fairly malarial, but Ostia and Portus were famously abandoned several times as a result of malaria. 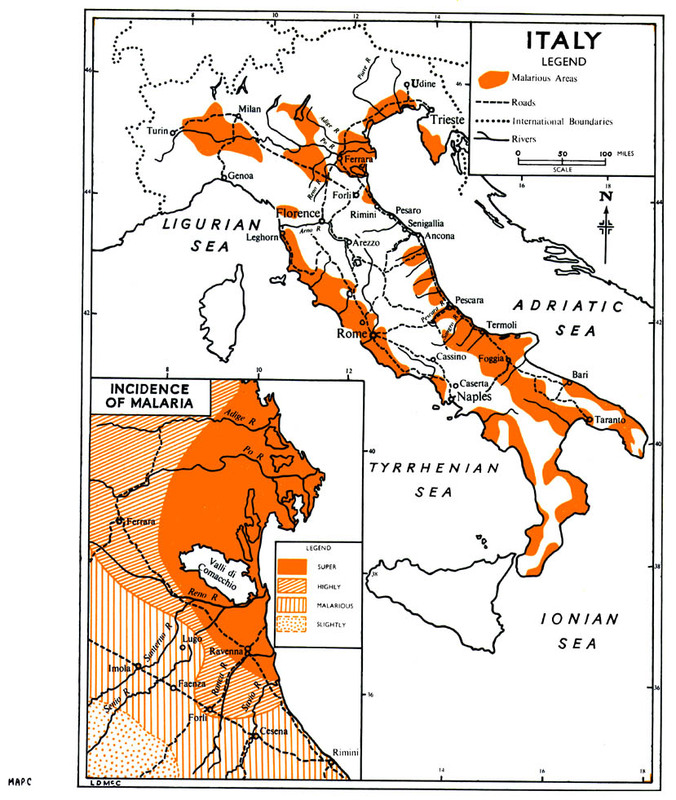 A greater prevalence of malaria could have had an influence on the ancient population of Portus/Ostia, as the people fittest to survive the marshy area would have been those with at least one copy of the HbS allele. Or perhaps Portus attracted more people from Africa - another area with high frequency of the HbS allele - than did Rome, as merchants or traders. I don't have a concrete interpretation of this graph yet. Perhaps I'm making too much out of the variation - after all, oxygen isotope analyses have only been done by Prowse and colleagues at Portus and by me at Rome. It's difficult to say with only two large samples what the variation means, and I'm not sure when I'll be able to tease out the effects of diet, water source, immigration, and disease on the oxygen isotope ratios of the Romans. It is clear from the two recent AJPA articles, though, that the interpretation of oxygen isotope ratios is getting more complicated all around. The work of Pollard and colleagues clearly shows that populations need to be compared to one another, not to a climatological map in an attempt to pinpoint a homeland. The research linking sickle-cell disease and oxygen isotopes is still quite preliminary, as Reitsema and Crews admit. But even if this research complicates our interpretation of oxygen isotopes as indicative of immigrants to Imperial Rome, it may hold great potential for our future understanding of malaria and population variation in ancient Italy. 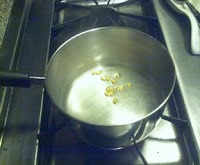 UPDATE - 9/23/11. This post has been translated into Ukranian by Sofya Kravchuk and can be found here. I'm happy that Sofya wanted to translate this post, and I hope I gain some Ukranian readers! Bianucci, R., Mattutino, G., Lallo, R., Charlier, P., Jouin-Spriet, H., Peluso, A., Higham, T., Torre, C., & Rabino Massa, E. (2008). Immunological evidence of Plasmodium falciparum infection in an Egyptian child mummy from the Early Dynastic Period Journal of Archaeological Science, 35 (7), 1880-1885 DOI: 10.1016/j.jas.2007.11.019. Killgrove K. (2010). Migration and Mobility in Imperial Rome. PhD dissertation, University of North Carolina at Chapel Hill. Pollard AM, Pellegrini M & Lee-Thorp JA (2011). 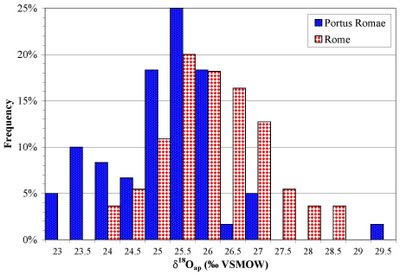 Technical note: Some observations on the conversion of dental enamel δ18Op values to δ18Ow to determine human mobility. American Journal of Physical Anthropology PMID: 21541927. Prowse TL, Schwarcz HP, Garnsey P, Knyf M, Macchiarelli R, & Bondioli L (2007). 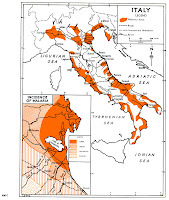 Isotopic evidence for age-related immigration to Imperial Rome. American Journal of Physical Anthropology, 132 (4), 510-9 PMID: 17205550. Reitsema LJ & Crews DE (2011). Brief communication: Oxygen isotopes as a biomarker for sickle-cell disease? Results from transgenic mice expressing human hemoglobin S genes. American Journal of Physical Anthropology PMID: 21541922. Sallares R. (2002). Malaria and Rome: a History of Malaria in Ancient Italy. Oxford University Press. Soren, D. (2003). Can archaeologists excavate evidence of malaria? World Archaeology, 35 (2), 193-209 DOI: 10.1080/0043824032000111371. Such a cool post! I love palaeopathology, and the possible link between certain diseases and isotope ratios is very interesting. For the geographical determinations based on water sources with samples taken recently, is there believed to be any change in the isotope ratios over time, or are they thought to be the same now as they were in the past, at least as far in the past as your research is concerned? That's a good question. I am assuming (as Prowse and colleagues assumed before me) that the climate in Italy has not changed significantly. They cite the Global Climate Model for the Mediterranean basin and the Global Network of Isotopes in Precipitation to conclude that not much has changed since Imperial times. So, we're working under a uniformitarian assumption. But I suspect that not a lot of palaeoclimate work has been done in Italy (although I could be wrong, as I haven't delved into these data). Can you differentiate between migrants who died shortly after their arrival vs those who lived there for a considerable time? If migrants or slaves are coming into a high malarial area from non-malarial areas you would expect a high death rate shortly after arrival. Has anyone looked for the sickle cell mutation in aDNA? Michelle - I hope that eventually I will have more data and be able to differentiate between immigrants who just arrived and those who'd been there a long time. My research only looked at first molars. But, by studying M1s from kids, I could narrow down the range at which they immigrated to Rome (e.g., kids who died at 6-8 years old whose M1s were anomalous for Sr/O probably immigrated between birth and 8 years old). Prowse and colleagues analyzed both M1s and M3s, and I plan to use the M3s in the not-too-distant future to see if I can figure out when immigrants came to Rome. It is an important question, since previously most people thought that immigration was engaged in by young men, and we bioarchaeologists are finding that it was men, women, and children. I don't know the answer to your question about aDNA, though. I gather one would have to do some sort of full genome scan. There has been some DNA work in skeletons from pre-Roman times (I think), and Prowse recently published a DNA analysis of a person from south-central Italy. But I don't know of anyone who's looked for a sickle-cell mutation in ancient Italian DNA. Would be cool, though! There shouldn't be that much problem getting genomic DNA from Roman skeletons. DNA has been taken from a set of 6th century skeletons from Bavaria and from Egyptian mummies (though of course those were kept in very different conditions). Sickle cell trait is a single base mutation in the hemoglobin gene so a simple PCR should do it. DNA degradation would be the problem. As I think you mentioned there are other genes that convey partial immunity to malaria, the thalassemias and, if I recall correctly, glucose-6-phosphatase def. 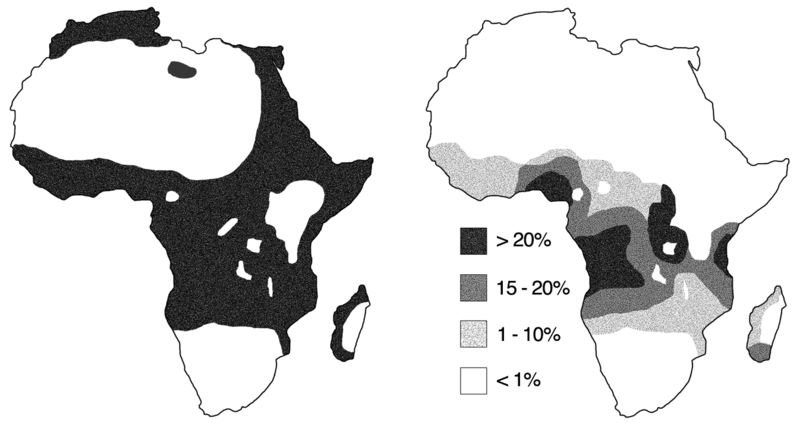 I think its so cool that malaria has effected human evolution more than any other infectious disease.